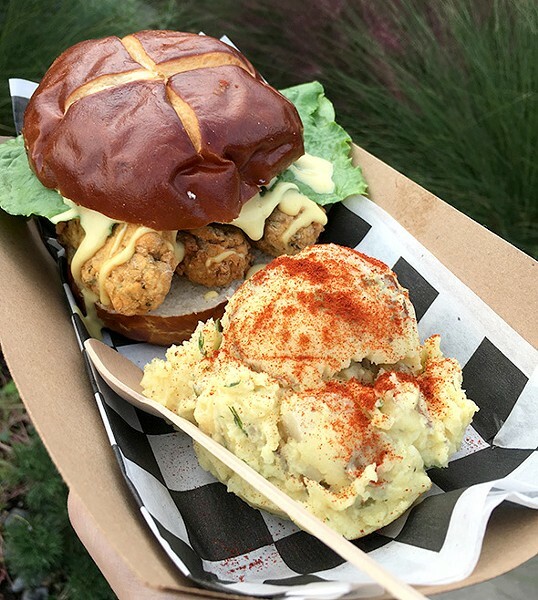 Plato’s Provisions’ vegan-friendly dishes are driving traffic to the new food truck. Clinton Farmer and Taylor Martin’s food truck Plato’s Provisions debuted in August. After graduating from University of Central Oklahoma, Taylor Martin and Clinton Farmer considered leaving Oklahoma, perhaps moving to a city with more vegan restaurant options to support their plant-based lifestyle. Instead of moving and hoping a new location — with a higher cost of living — would provide the change they were looking for, they decided to stay and be the change they wanted to see in Oklahoma City. 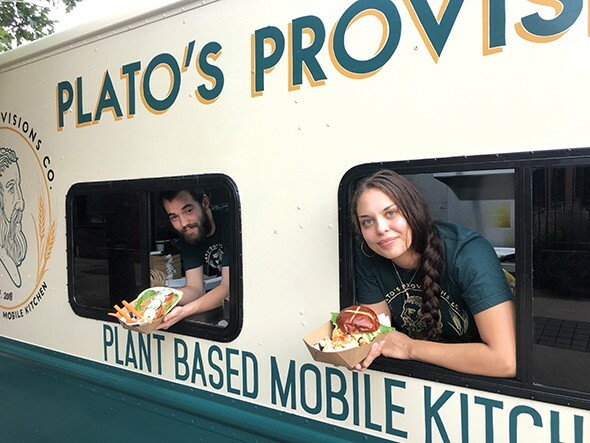 Martin and Farmer — both 25 — launched Plato’s Provisions Co. in mid-August after a six-month rehabilitation of an old food truck that included new flooring, paint and cooking equipment to eliminate any cross-contamination from the truck’s former life as a barbecue restaurant on wheels. Oklahoma City’s growing vegan-friendly population was highlighted during September’s inaugural VegFest OKC, when organizers told Martin and Farmer to expect crowds in the hundreds. 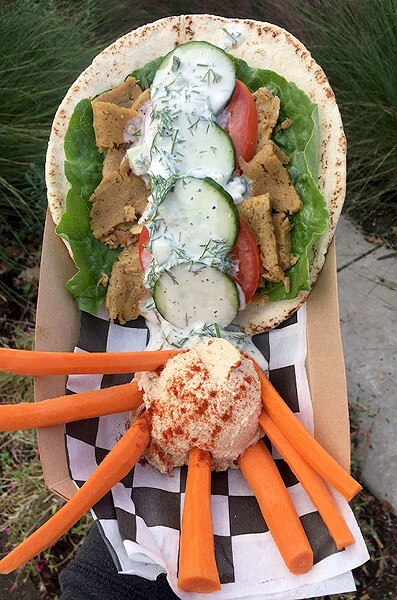 An estimated 4,000-6,000 people attended VegFest, and people stood in three-hour lines to try Plato’s Provisions’ menu of seitan-based meat replacements. 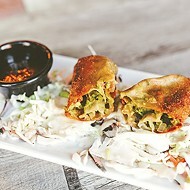 In the years since college graduation, Martin and Farmer traveled to vegan restaurants in the region like Modern Love in Omaha, Nebraska, Watercourse Foods in Denver and V-Eats Modern Vegan in Dallas and want Plato’s Provisions to be in a similar vein, where small-batch seitan drives the menu. Many large-batch plant-based proteins like tofu, tempeh and seitan are filled with sodium and preservatives. On days when the truck is operating, Martin gets up early in the morning to combine water with vital wheat gluten and a special mixture of seasoning depending on the product. The truck currently sells seitan in the form of thin gyro strips, barbecue brisket, fried chicken strips and Philly cheesesteaks. Martin said that seitan is the best option for both flavor and texture, saying that people ask if Plato’s barbecue is made with jackfruit because it’s not their favorite option. Martin does acknowledge that seitan eliminates anyone with gluten intolerance and that they’d like to unveil a gluten-free tempeh option in the coming weeks. Seitan dates to 6th century China, where it was used as a meat substitute for vegetarian sects of Buddhist monks. A 100-gram serving of seitan offers 75 grams of protein — 150 percent of the daily needed volume — and a full range of essential amino acids. Farmer and Martin are veterans of food service. Farmer became a manager at a Coolgreens location while still in high school, and the duo also worked at The Loaded Bowl’s Farmer’s Market District location, 121 SW Second St.
Farmer was originally inspired to pursue a plant-based diet after taking an animal ethics class at UCO. The name of he and Martin’s business derives from Plato’s The Republic, in which the Greek philosopher says a city that relies on cattle for food will inherently need to go to war to get more land to raise its cattle. Seitan-based fried chicken is topped with honey mustard, pickles lettuce and served on a pretzel roll. In two months of operation, Martin and Farmer said they had enough bookings and support for the truck that they’re considering quitting their day jobs in order to elevate Plato’s Provisions from weekend warrior to everyday service. 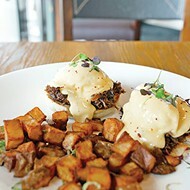 They’ve found an anchor for a weekend brunch that features sweet and savory chicken and waffles at Anthem Brewery, 908 SW Fourth St., and Plato’s Provisions will have its first midweek lunch service during the Holiday Pop-Up Shops at the corner of NW 10th Street and Hudson Avenue beginning Nov. 23. 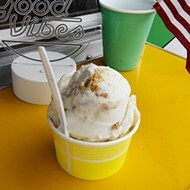 “People ask when we’re going to have a brick-and-mortar location, but we just opened,” Martin said. Farmer said that they’re hoping to have a permanent location by the beginning of 2020, but they want to add tempeh to the menu and expand to vegan meal prep, especially during the winter months when weather might sideline the truck. “When people have a vegan option, it’s amazing how receptive they are to it. We have people who come to the truck and don’t realize that it’s vegan,” Farmer said. “They just thought [plant-based diets] are just salads or vegetables. It opens people’s minds up to it being an option that I can enjoy.